Airbus may have confirmed production of the A380 is ending, but the aircraft manufacturer is continuing to deliver brand new superjumbos to airlines around the world. 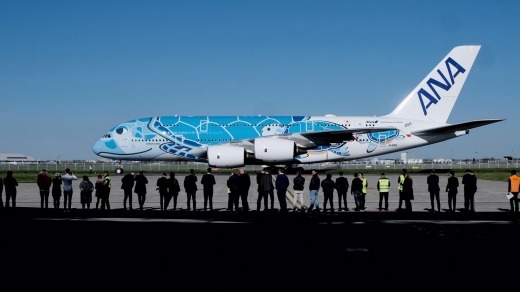 All Nippon Airways (ANA) became the first Japanese carrier to take delivery of the world's largest passenger jet on Wednesday, receiving the first of three A380s at a special ceremony in Toulouse. 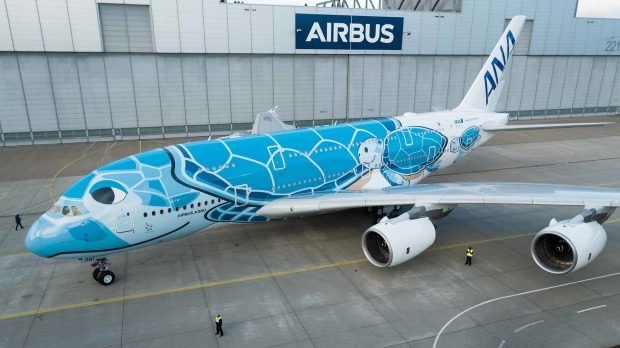 The airline that has previously decked out its planes with Star Wars themes also gave its first superjumbo a special paint job. 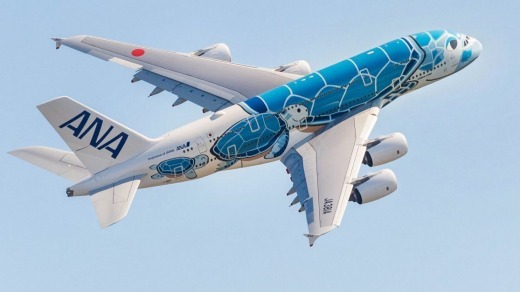 The livery features a Hawaiian green sea turtle, named Honu, in honour of the route the plane will fly – Tokyo to Honolulu, starting from May 24. The green turtle is depicted as blue on the actual aircraft, with the airline's next two A380s to feature green and yellow turtles. The ANA superjumbo features four classes for a total of 520 passengers. The upper deck is for well-heeled travellers, with eight first class, 56 business class and 73 premium economy seats. The lower deck features 383 economy seats, including 60 "couch" seats – the same concept as Air New Zealand's Skycouch, where three economy seats can convert into something approximating a bed. 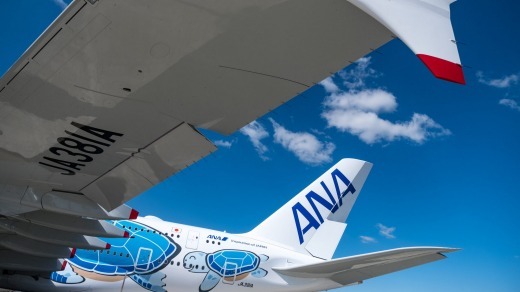 "We will commit all three of our Airbus A380 to the Tokyo-Honolulu route with the goal of introducing a new level of luxury service to our passengers flying ANA on the No. 1 resort route for Japanese travellers," said Shinya Katanozaka, ANA president and CEO. There are now 232 A380s in service with 15 airlines around the world. Qantas currently has 12 A380s in its fleet but recently cancelled its order for eight more. Last month, Airbus announced it would end production of the superjumbo in 2021 after its biggest customer for the aircraft, Emirates, reduced its order for new A380s in favour of smaller A350s and A330s. Launching in 2005, the A380 was Airbus' attempt to compete directly with Boeing and its successful 747 jumbo jet, which recently marked its 50th anniversary. However, large, four-engine jets have fallen out of favour in recent years with airlines preferring smaller, more fuel-efficient planes such as the Boeing 787 Dreamliner and Airbus' own A350.